Back in Nicaragua again. But a slightly different itinerary this time around. Spending a day or two on either side of the humanitarian work to see more of the country. First stop was a town called Granada, east of the capital Managua and located on a volcanic lake where freshwater sharks play. I’d never heard of them either, apparently this is the only place they live. Swimming up the rivers like salmon. Interesting. We caught a luxury taxi ride from the airport – meaning it had air conditioning – and were there about 45 minutes later. Stayed at a nice place called Hotel Patio del Malinche, a couple of blocks off the main square towards the lake. Granada herself is much more touristy and appropriate for expat living than is Chinandega. But yet still much less touristy than most places I’ve been. There is a central area where tourists comply with the obligatory invitation of any centralized market to go see what life is about in the local area. Booths targeting tourists don’t quite clog the square but they impede the way with large tents, tables and other accoutrements. But it all seems a bit staged. Several identical vendors sell things but to no crowds in the off season. No fewer than three ice cream bike vendors pedal over each others’ tracks in concentric circles. It’s like walking into a fair where all the rides are going but nobody is on them. A little off putting. But when the town realizes that it’s Saturday night and the tourist crowds (such that they are) flock to the many restaurants and bars catering to their tastes, the streets and local establishments shine. Side streets close to the tourist areas even have vibrant local venues. And you’re as likely to run into a group of college kids as not. Tourists have their havens but the places where they’re not really typify this town. So when the taxi came this morning to haul us off I left with a feeling that I hadn’t really seen the town. I certainly hadn’t done the many local activities available like kayaking and ziplining, but I had also missed out on the real treats like the lake itself and the real life functioning of the city. It’s not a place to spend a lot of a limited amount of time but as a couple of day layover you could do worse. Back in Chinandega now and glad it’s off the beaten path. True, there’s not a luxury accommodation like we had in Granada but then again I’m not tarred as a tourist. The local places smile at the novelty rather than smirk at the gouging. Happy to be here. I went to Brazil and didn’t tell you for too long. Sorry, Internets. Here’s a short catchup. Flew into Sao Paolo to do a presentation for work. Getting a Visa to go was an expensive hassle but got it done by shipping my passport and a pile of cash to some dude in New York who carried it to the consulate the next day, waited around to get it approved and added, then shipped it back. I’m not sure how he got it done, but nobody at the immigrations office seemed to have any problems with it so I was good to go. Met up with a colleague, then went and got checked into the hotel. He is fluent in Spanish and passable in Brazilian Portuguese so we got around OK. Next day we went into the local office and met a bunch more folks. Ended going out with them for dinner that night and a couple of drinks after. We went by a very interesting place called Hotel Unique, which is shaped like a giant wooden boat. Then we went to a rooftop bar from which we could see a large portion of the skyscrapers in the city of 20+ million. After the work event I headed down to the small city of Porto Alegre, in the state of Rio Grande do Sul. Another colleague lives there and I met up with him. He had a day of activities planned, including a tour around the corporate and university campus, lunch in the eclectic cafeteria and hanging out with friends. Over the weekend he invited me and a lot of friends over to his place to do a traditional Brazilian barbecue (barbacoa). 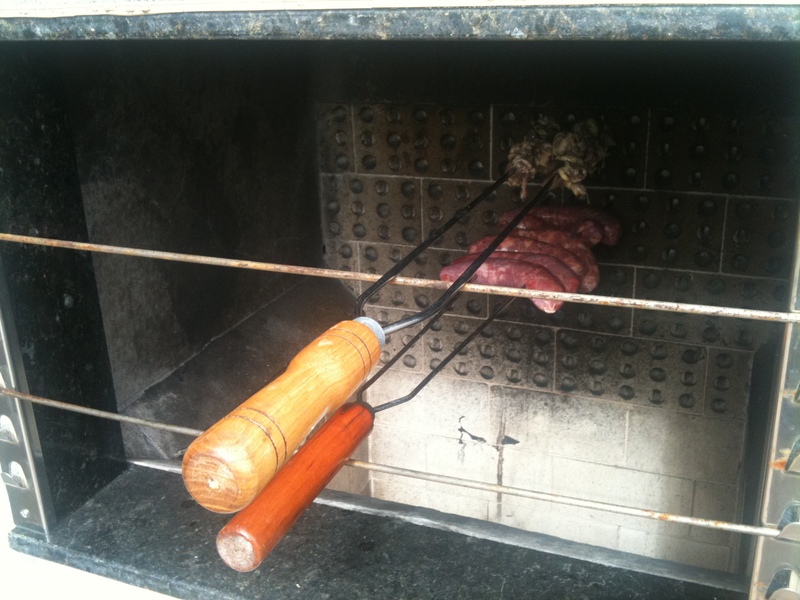 Their way is different because they set the meat far away from the fire and do a slow roast. 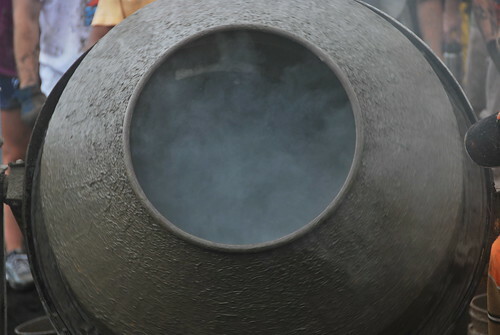 They use wood, rather than charcoal, so the meat takes on a smokier flavor too. It was absolutely delicious! Porto Alegre, POA to those who fly in, is a great little city. About 3 million people so not really a metropolis. Rolling hills for a backdrop and gaucho culture similar to that of Argentina. 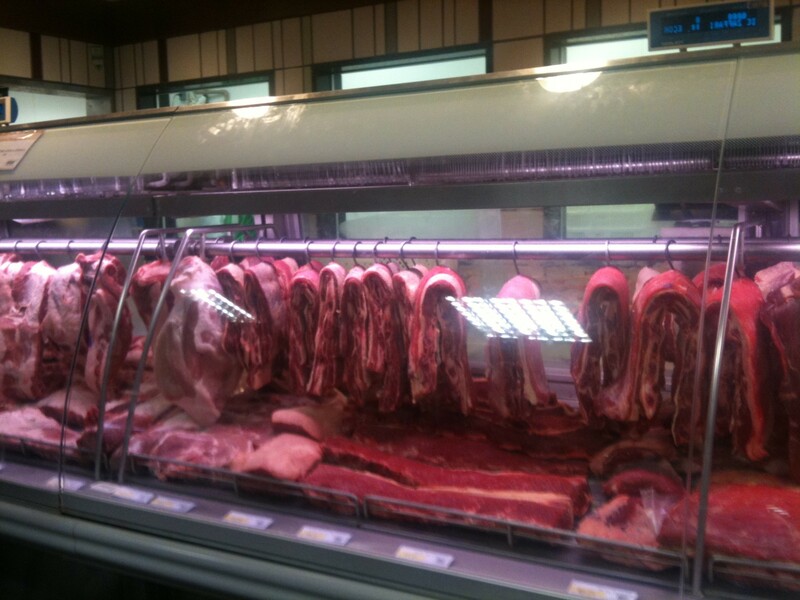 Lots of beef. Churrascorias and things. Some slow roast the meat for a dozen hours or more so it’s very tender and delicious. No sauce or rubs except a sprinkling of salt so it’s just the flavor of the meat. There’s a really fantastic little place called Costela no Rolete you should ask about if you go! There are some hills overlooking the city and they give a magnificent view of the city, river, rolling hills and plains off in the distance. Very nice city. Great weather the whole time I was there. A sweetened, carbonated guarana juice is a popular drink here. It’s easy to see why – tasty and refreshing. There seem to be several regional favorites with slightly different flavors. In Rio Grande do Sul they’ve got a traditional drink that’s like a chilled yerba mate. It’s pretty tasty. Everything is really expensive. A value meal from McDonalds is over $10, and drinks range from $7-8 for a cheap beer to $30 for a draft in a nice bar. Outrageous! Lots of local beers. Fine German and Italian beer tradition. One of the best I had was Bohemia. Classic pilsner taste – very clean. I’m not a big pilsner fan but this one was good and great on a hot day at a cookout. At the airport the security line goes very fast. Mainly because a strip search isn’t involved but also because they’re well staffed. Don’t have to take off your shoes. Don’t have to remove your laptop. Don’t have to remove liquids. I don’t know what the rules are for size etc. because I didn’t run into any of the limits. And nobody checks your documents when getting on the plane. 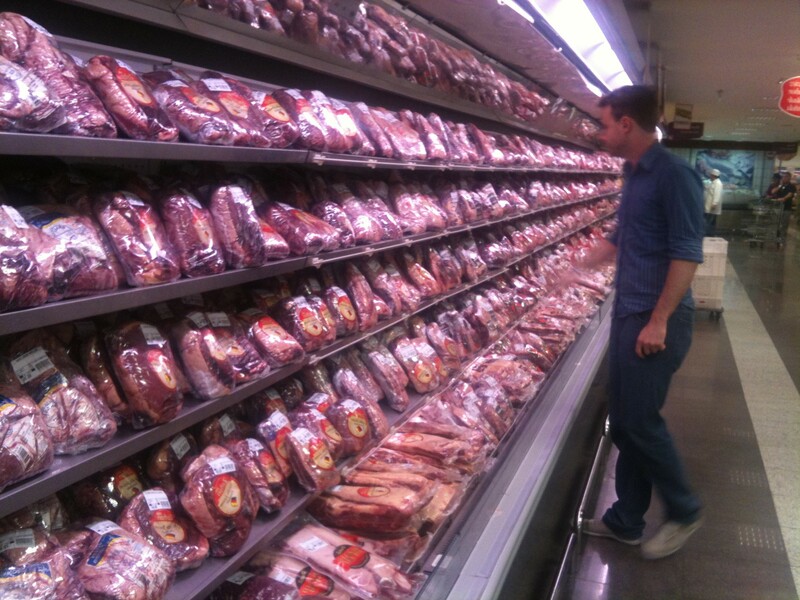 The grocery store has a whole aisle of meat. It’s fascinating. I had great fun in Nicaragua. Despite all the hard work and heat, it was quite an experience. The people there were great – friendly and polite. And at the end of the day you felt like you’d accomplished something tangible to help real people. And working that closely with people you normally see in a much different capacity was also great. I learned a lot about my coworkers and we definitely formed bonds that will last a long time. We learned that we can trust one another to pull just as hard during just as trying circumstances. I wouldn’t hesitate to lean on one of those folks in the future and would hope they’d feel alright leaning on me if they need it. There are geckos all over the walls. At night they hang out by the lights and catch moths. 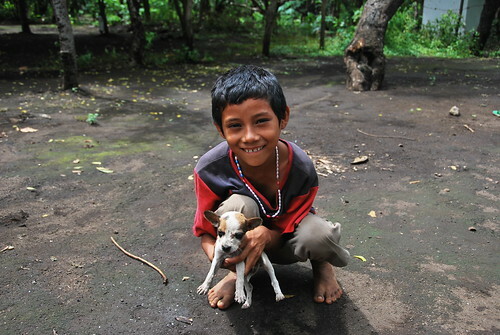 In Nicaragua the ‘S’ is silent and the ‘C’ is pronounced like they do in Barcelona – that is, with a “TH” sound. The long-timers here say that you don’t get sore after a hard day’s work because you don’t ever get cooled down like you do in the US. Sure enough, after I got back and hit the cool weather I got sore. Funny, that. Most of the folks didn’t speak much, if any English. But I got much more confident speaking Spanish with them and wasn’t ever really stuck for communication. Well, back to the real world…. Yesterday was hard work. Really hard work. So hard, in fact that I couldn’t even bother to post anything. We dug a trench in a dry gully so we could lay a pipe to transport water to a small town. The gully typically fills up in the wet season so we had to go deep. 4-4.5 feet deep. And being a gully we hit lots of rocks. Big rocks. 1,000 pound rocks. One of our guys broke his toe. One got hit in the face with a giant steel pole. And it was the hottest day yet with no breeze and no shade. Until it started raining and caving in our trench. And lightning was striking so close we could feel it in the metal pipe we were putting in the ground. Man, it sucked. But we stuck it out and got most of the pipe put in. The biggest rock out there is still there and we don’t yet know how we’re going to get rid of it. But that’s a problem for another day. When we got home we ate and showered and then went to a local bar to celebrate one of our guy’s birthday. The place was called Restaurant El Paraiso. We had a few drinks and chatted about the day and the trip. Then we got serenaded by a couple of not quite mariachis. It was great. This morning we got to sleep in a bit – breakfast at 9 instead of 7. Then we sat around for a bit. 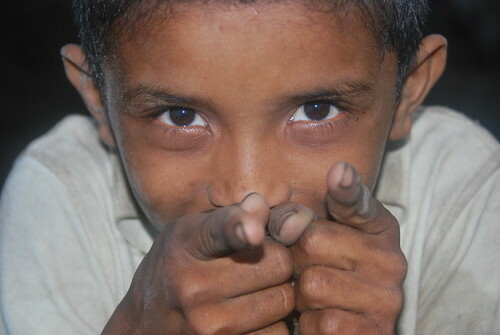 At 1–ish we headed out to an orphanage for disabled children. Most are physically and mentally disabled, primarily due to malnutrition when they’re in utero or very young we were told. We hung out there for about an hour or so with them, reading, playing, and just interacting with them as best we could. Then we headed out to the city during the day for lunch and to just hang out. It was good fun exploring the city. Some places were pretty seedy but nothing felt too unsafe. I managed to navigate the sales processes pretty well in my broken Spanish – few people here speak English. After lunch and everything we piled back onto the bus and headed to the house. We got changed, loaded up the truck and jumped in the back. Headed out to the farm, unloaded our digging equipment again and headed out to the plantain fields. Today we were going to be digging an irrigation ditch. More freaking digging. But this time the soil was nice, rich topsoil instead of sandy, rocky wash debris. We were all full of energy. The weather was a bit cooler. The ditch needed to be shallower. We had an easier time of it. We had some tunes to motivate us. The work went much faster. In fact, we got through it probably faster than the folks here expected because the pipe wasn’t due to arrive until tomorrow. One of our guys even found an arrow or spear head! Today’s work was a huge success and morale builder. We’re now back at the house telling stories, playing cards, having beers and in general loving things. It’s a great feeling. Some of the folks are headed home tomorrow, some on Friday. I’m trying to round up a group who might want to stay until Sunday and see more of the countryside. I’m exhausted. I’m dirty. I’m sweaty. And I feel good. We did a lot of work today. Started out at 7am with breakfast and coffee. Then went out to the local dump. There is a tent city beside the dump where lots of folks live. They were displaced by Hurricane Mitch about a dozen years ago. They make their living by digging through the trash as it comes into the dump. It’s pretty filthy work. And they don’t make a lot of money doing it. Then we went out to Villa Santa Catalina. That’s the city that is being built to accommodate those who want to leave the dump. Small homes made of concrete and brick in a community with a soccer pitch and basketball court. They’ve got a couple of schools built because they outgrew the first one. First task was to dig latrines. Don’t worry there was nothing in them yet. But we dug trenches 60cm deep. It was hard work out in the hot sun. Shovel. Pick. Measure. Shovel. Pick. Measure. Repeat. Move to the next one. Then we moved onto helping lay the foundation in the houses. Shovel sand, shovel gravel, mix with concrete, add water, mix more, keep mixing, shovel into buckets, carry the buckets to the house. Repeat. That was more grueling than the digging. We had lunch at about 12:30 – PB:&J again. Then back to work. We worked until about 5:30 or so. It sounds a lot easier when I’m typing it out than it was to actually do it. Lots of people over exerted themselves and had to take an extended breather. And we took some time here and there to play with the kids who ran to us to try and help out. It’ll be an early night tonight. Ate dinner in one bite I think. Waiting for the showers to clear out. Going to have to burn these clothes or something. Tomorrow we’re going to be helping to build a bridge. This morning we started out with breakfast. Had the option to go to Church and I took it. Great chance to visit the culture of the place, even if I wasn’t going to be able to understand what was said. The place was humble by European church standards, but this is a humble town in a humble country. It was pretty cool – first communion for a bunch of kids. Some people thought it was a terrible thing, but I thought it was a great experience! That made the service drag on a bit so I jumped outside and snapped some photos.When that was over the choir, composed entirely of kids, did a Spanish version of what I think was Blowin’ in the Wind. One thing I noticed is that all the candelabras used fluorescent bulbs. For a greener Nicaragua or because electricity costs so much? But if a small church that serves a poor population in one of the poorest countries in the world can afford replace their lights, why can’t most Americans? After that we came back to the house and changed clothes. We were going to climb up a volcano! Cerra Negra – Black Mountain – is an inactive, though not dormant, volcano made entirely of black pumice stone. It’s a huge pile of heat-attracting sand and gravel with sharp edges. And its face is almost straight up for 2000+ feet. Who came up with this idea again? We got started and it was slow going. Up 2 feet, slide back down 1 foot. Again and again. The group quickly got separated as some climbed quickly, others more slowly. Mostly climbing on our hands and feet due to the grade, it was kind of miserable. About 1/4 of the way up I wanted to turn back; 1/3 of the way I was concerned for my life; 1/2 of the way I was concerned for my sanity. By 3/4 of the way I had a technique and it was a bit easier. And when I looked down the people looked smaller than the people at the top for the first time. By 4/5 of the way up I was convinced I could make it. The grade leveled out a bit and it got easier even though I was exhausted. When I got to the top it was worth it. My legs were quivering but the view made up for it. And the PB&J we’d packed for lunch was delicious! There was a nice breeze, some cloud cover had moved in and it was nice. I walked around the top and looked down into the caldera, photographing the steamy sulfur rising. We waited for the rest to join then began the descent. It was faster and much more fun! Essentially you run or jump or slide down the mountain the same way you came up. It was a blast! Everybody was doing it and when I turned up the hill to look at those coming down it was quite a sight! I found that I could somewhat ski down the mountain, almost like cross country skiing. Worth the toll the hike up cost me. We came home and had dinner quietly. Everybody was exhausted. Bedtime will come quickly tonight.